The Tenth Planet was the first Doctor's last story and notable for the first regeneration and the first appearance of the Cybermen, although unlike their modern counterparts, these Cybermen appeared to have come from Mondas via Sweden. The show was written by Kit Pedler and directed by Derek Martinus. The four episode story was originally broadcast between 08 and 29 October 1966. The story is presented across two DVDs with the episodes on the first disc. This disc also contains a number of extras. Frozen Out (29 min, 11 sec) is the retrospective Making of... piece. It covers the delicate matter of Hartnell’s departure from the show. Surprisingly, there are still many alive who were involved in the show to offer their reminiscences, although much of the documentary is carried by Anneke Wills (Polly). Most of the show survived the BBC culling, apart from episode four, with only off-air audio recording surviving. In the main story this has been replaced by flash animation, but there was an earlier attempt to reconstruct the episode, using the audio and slaving this to the surviving photographs and small filmed sections. Episode 4 VHS Reconstruction (24 min, 23 sec) is interesting for the photographs, but not as engaging as the animated version. 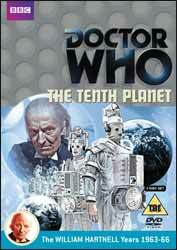 The Coming Soon is for Troughton’s The Moonbase, another Cyberman story. As well as a couple of extras the disc contains the full length commentary with Anneke Wills, Christopher Matthews, Earl Cameron, Alan White, Donald Van der Maaten, Christopher Dunham and Peter Kindred. Disc two’s extras opens with an Interview with William Hartnell (3 min, 19 sec), only a small part still exists, but it’s enough to show how testy Hartnell could be, even the interviewer accuses him of being grumpy. Carrying on with the Doctor Who Stories, we have one featuring Anneke Wills (13 min, 40 sec) recounting her memories of playing Polly. The Golden Age (15 min, 50 sec) takes a look at how to define whether Doctor Who ever had a golden age and how to judge this. This sort of thing is pretty much filler as the obvious answer is that yes it did and it was at whatever age you started watching, which influenced who your favourite Doctor will be. Unfortunately the mini doc loses its way when it digresses into a discussion regarding the level of violence in the show. Boys!Boys!Boys! (19 min, 34 sec) and given the amount of material devoted to the screaming female companions, it seems only fair that the spotlight is turned on the male companions. We have Peter Purves, Frazer Hines and Mark Strickson in a round robin discussion about their time on the show. Companion Piece (24 min, 25 sec) takes a look at the role of the companions with both old and new looking at their dual role of being our way into the story as well as their effect on the Doctor. This changed over time from Susan, who needed a lot of rescuing, to the current crop who have been both more confident and self-reliant. Blue Peter (9 min, 6 sec) had a long and important relationship with the show, both for good and ill, especially given they lost some of the episodes. This small piece appeared around the time of The Five Doctors and tells a shortened version of the show's history. The story of a base invasion, an idea which would be repeated many times over the show's history, still works well today. Much of the shock value of the Cybermen has been reduced by their own evolution within the show. Swedes, in a body stocking, sporting an electric fire on their chests doesn’t have the same effect today as it once did, but for all that, the print is remarkably good for its age and until episode four reemerges from some remote part of the world, this is as good as it gets.